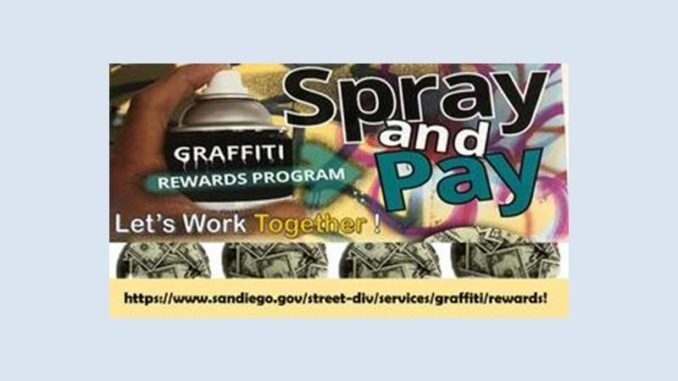 The City’s Spray and Pay Rewards Program rewards citizens up to $500 for information leading to the arrest and conviction of graffiti vandals.​ Remember, vandalism is a crime. If you see a graffiti crime in progress, call 9-1-1. Do not confront the vandals. Although they may appear to be harmless, they may be carrying weapons. The police will respond based on the priority of the crime compared to others for which they have calls at the time. For more information on the Spray and Pay program, visit the street division services pages at www.sandiego.gov/street-div/services.